I've been to Milton Keynes a few times. The first time was on 29 May 1993 to see Guns 'N' Roses perform at the National Bowl. I went back two years later, on 29 July 1995, to see REM play at the same venue. My overriding memory was of a town of roundabouts and dual carriageways. 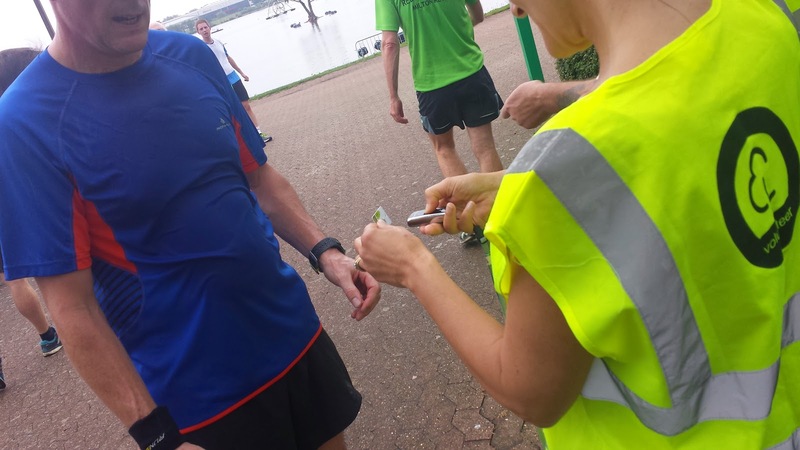 So I was intrigued as to what delights I might find at Milton Keynes parkrun - twice voted 'the most beautiful parkrun' in a poll conducted by the parkrun show. I'd had it on my list of venues to visit for ages, but it wasn't until I received an invite from Peter, who is a regular runner here, and a fellow parkrun tourist, that I finally decided to visit. Milton Keynes is a 'new city' and was developed in the 1960s. It took its name from the existing Milton Keynes Village - the village still exists with the boundaries on Milton Keynes which contains the area's oldest surviving domestic building - a 14th century manor house. Nearby is Bletchley Park, which was home to the 'Government Code and Cypher School', which cracked the famous Enigma Code. To the north east of the main town centre, in the Willen district, is Willen Lakeside Park. 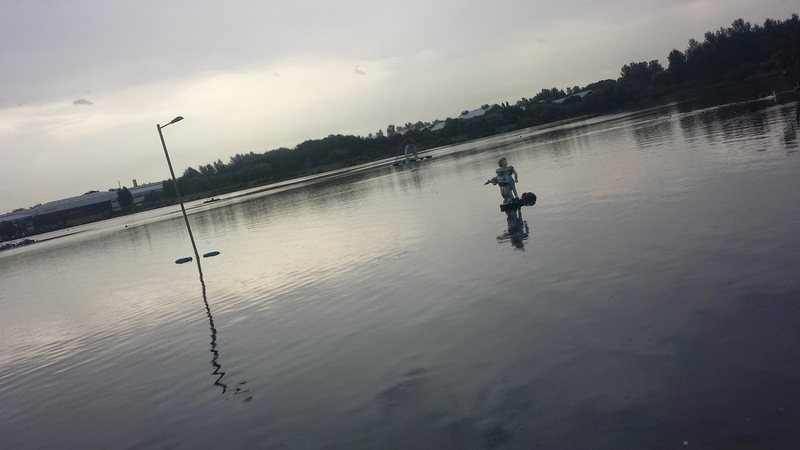 The lake is one of the largest purpose-built stormwater balancing lakes in the UK. It features two separate basins. The north basin is a haven for wildlife and is home to many species of wading birds, fish, and insects, while the south basin has been designed for recreational use. There is a play-and-display car park at the south west corner of the lake, charges are fairly reasonable; 80p for an hour, £1.20 for two. I arrived at 8am and decided to stick in £2.20 to cover me for up to four hours so I didn't have to watch the clock post-run. Any locals that choose to travel by bicycle will be able to take advantage of the 272.5km 'redway' network of cycle paths, known locally as 'redways'. 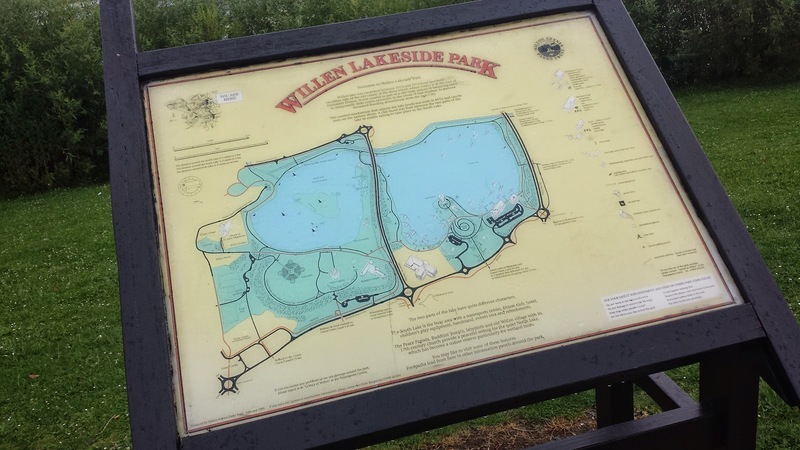 Upon arrival, cyclists will find some cycle racks next to the south lake just outside the LA Fitness Health Club and Willen Lake Camping. There are more bicycle racks further along behind the cafe. The area just outside the cafe is a central point where many runners and volunteers congregate before the start of the run. Others go straight to the start. Just before joining the runners, I popped into the Premier Inn which has toilets that are open to the public. At this point it is worth noting that there has been a very recent course change at this venue. There's not a huge difference, but as of 19 July 2014, the official course page still shows the previous route - I'm sure it'll be updated soon. The run no longer starts adjacent to the lake. The new course starts on the path that runs from the lake/cafe area towards the Grand Union Canal, where you can also see the Gulliver's Land theme park (apparently the best family day out in Milton Keynes) over to the right. This new starting point gives a much wider start than the old one, so really helps out with the approx 400 runners that run here each week. The course is almost completely tarmac, is largely flat (but not completely), and is a one lapper, or more specifically, a point-to-point course (oh yes, one big 5k loop!). From the start, the run heads towards the Canal up the very slightest of inclines and turns right at the end where the runners run along a very neat line of trees that follow the line of the canal. Unfortunately, the runners don't really see much of the water as it is hidden behind some thick bushes for the majority of the section. The runners soon pass underneath the H5 Portway dual carriageway. Then a short while later they turn right and leave the canal behind them. 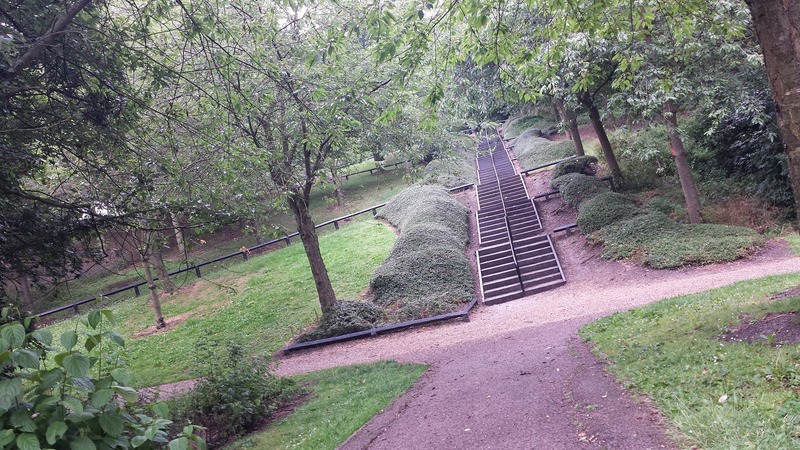 The next path drops slightly downhill and then brings the runners to a footbridge which passes over Brickhill Street. 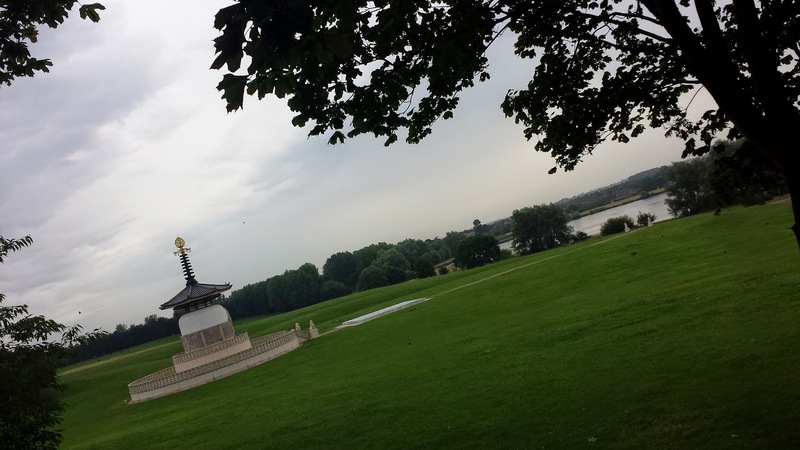 Next up, the runners run towards a staircase which leads up to the Willen Peace Pagoda. 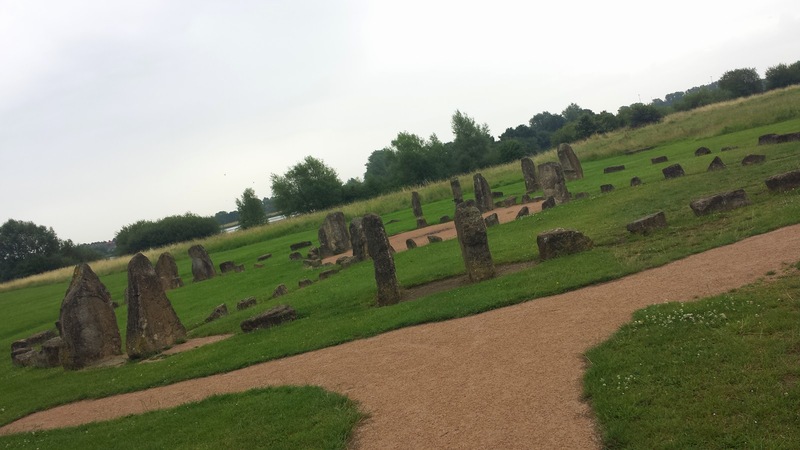 However parkrun doesn't do steps, so the runners have to negotiate the zig zags to reach the top, before turning left and circumnavigating field which contains the Willen Lake labyrinth and then running adjacent to the north basin of Willen Lake. The Peace Pagoda can now be seen to the runners' right - It was built by the monks and nuns of Nipponzan Myohoji as a symbol of world brotherhood. Nearby are 1,000 cherry trees to commemorate the victims of war, and messages of hope decorate the One World tree. The runners then reach and pass the 'circle of hearts medicine wheel', which is a stone structure (or stone circle) set on sacred green space. The wheel is made up of 108 limestones from the village of West Underwood. From here the route passes underneath the H5 Portway and brings the runners out on the northern bank of the southern basin. 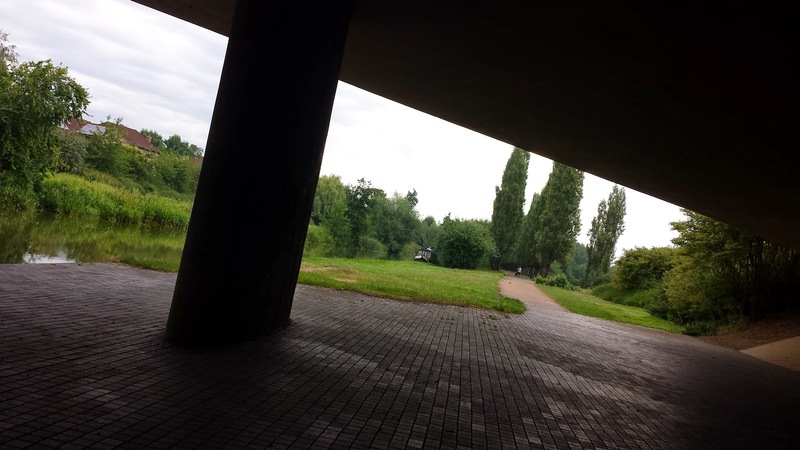 The runners follow this path all the way along the northern bank under, which takes them back under the H5 Portway, over a small bridge which crosses the link between the two basins, and then back under the H5 Portway one final time. The runners now follow the path along the eastern edge of the basin, which runs parallel to the River Ouzel. 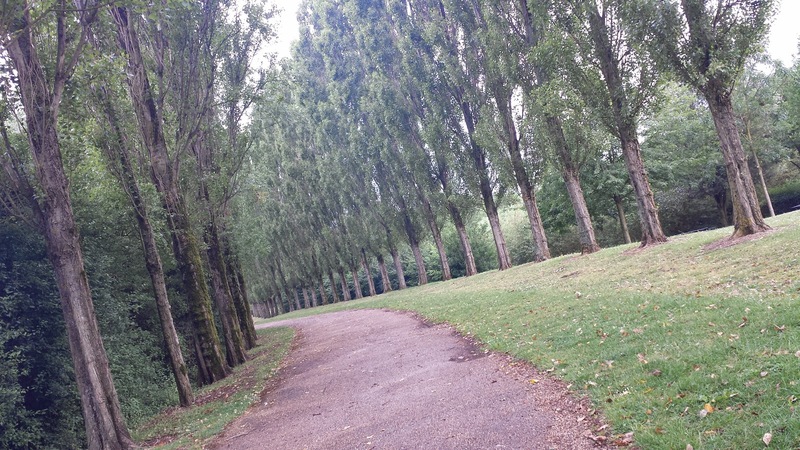 This path leads around to the southern edge of the lake, which passes the Ariel Extreme adventure experience - It contains a climbing wall, zip wire, and other similar things including rope bridges etc. All that's left is for the runners to go around the last corner and pass through the finish funnel, which is located right next to the lake. Barcode scanning takes place right next to the finish. There are a large number of runners here (342 on the day I visited) so in order to cope with the numbers, they have three volunteers with barcode scanners on duty. After this, the runners and volunteers head over to the cafe for some refreshments. I popped over but when I saw a queue and thought about my journey back home to Kent, I decided that I better get a move on. I always enjoy a visit to a new parkrun, and this was no different. However, the weather was so, so humid (even worse than the previous week, I'd say) that I didn't really enjoy the action of running. 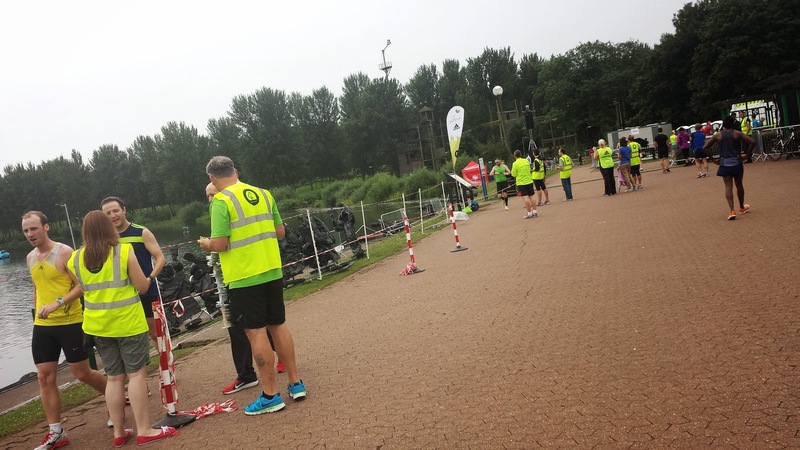 I was however pleased that I had finally made the effort to run at this venue - my 80th different one (and 19th consecutive sub-20 minute parkrun). From next week I am committing myself to the new Dartford parkrun for a while, so the touring will have to take a back seat. However, I will return to it when possible. With the lack of parkrun touring, I'm looking forward to a smaller petrol bill for the next few months! Update: I understand that since I ran here the course has been changed. 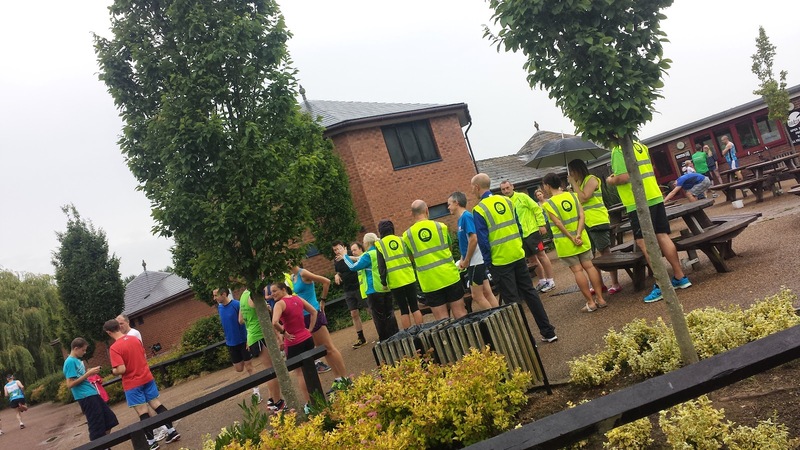 Please see the Milton Keynes parkrun website for the latest information. 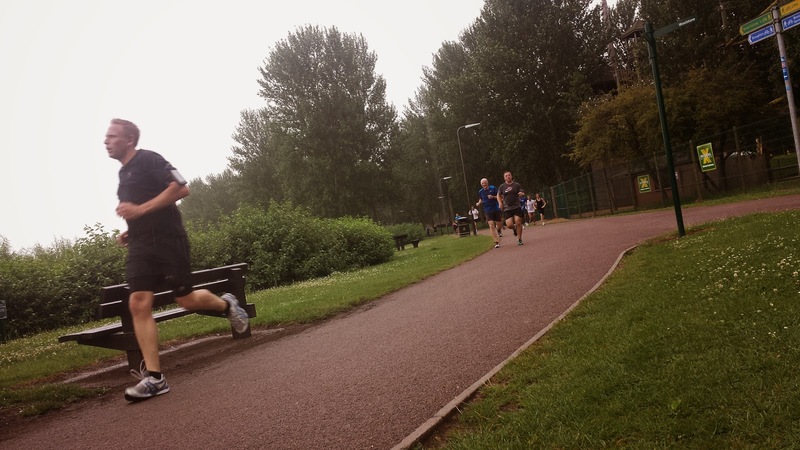 Another update: Milton Keynes now has a second parkrun, which you can read about, here: Linford parkrun blog.